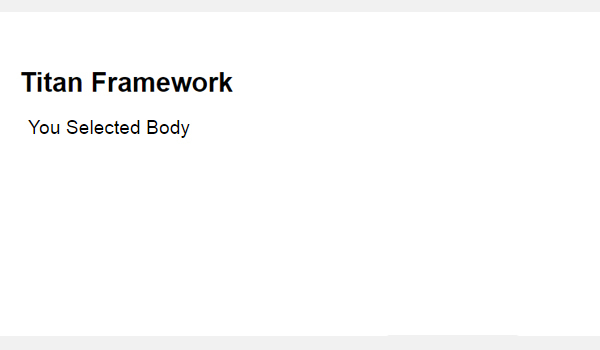 When creating a dynamic set of options, you should always provide an end user with a set of choices, and radio type options in Titan Framework can help in this regard. 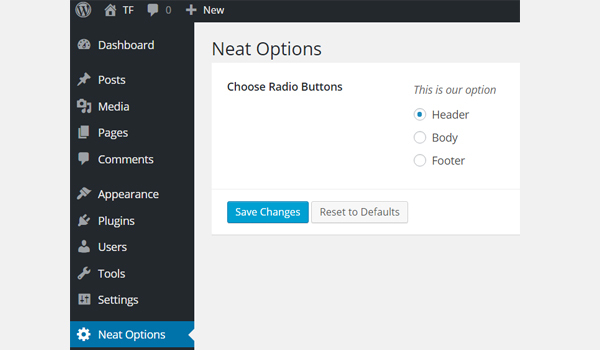 Let's see how you can create radio type options inside a WordPress custom admin panel, a meta box or the theme customizer. name: It shows the display name of the radio type option. id: This parameter assigns a unique name which helps to get the saved options values. options: It is an associative array which takes up value–label pair options displayed as radio buttons. default: (Optional) It assigns a default value. livepreview: (Optional) This parameter displays the live preview of changes when a radio type option is added inside a theme customizer section. css: (Optional) Whenever you add this option inside an admin page and/or theme customizer section, this parameter automatically generates CSS. All the parameters are of type string except the options parameter, which is array by type. Get a unique instance via the getInstance() function. Add an option via the createOption() function. Get saved values via the getOption() function. However, if you want to learn about how these containers are created with Titan Framework then skim through my previous articles. 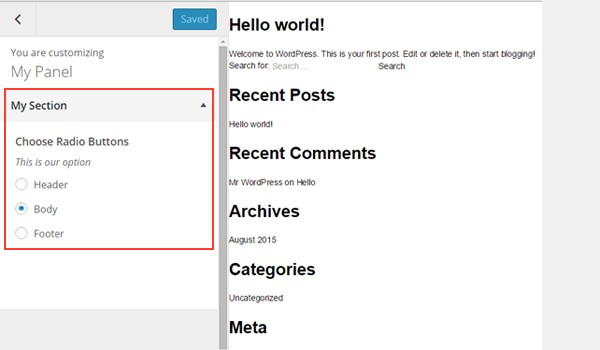 First I'll create this option type inside an admin panel. 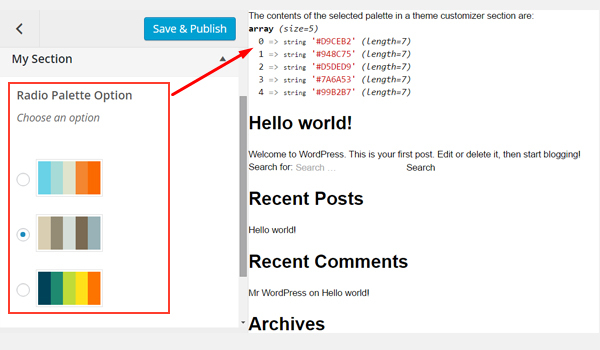 I'm adding a radio type option in an admin panel $aa_panel via the createOption() function in line #7. As you can see, this function takes up an array of parameters which this option supports. So, I've defined values for parameters id, type, name, desc, default and options. In this code, I created a list of three radio buttons named Header, Body and Footer, each having a unique key, i.e. aa_hdr, aa_bdy and aa_ftr. Think of it like a set of options which you want an end user to choose from. 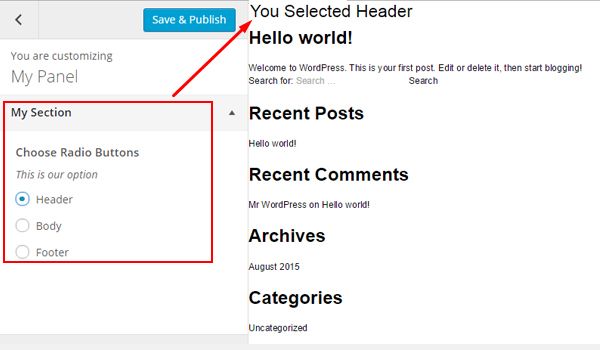 For example, if you want to display a note, a user could choose if it should be displayed in the header, body or footer. You can find a radio type option inside an admin panel Neat Options. Let's get its saved values. $titan = TitanFramework::getInstance( 'neat' ); // we will initialize $titan only once for every file where we use it. First of all, get a unique instance value in line #3. Then use the getOption() function, which takes up the ID aa_radio as a parameter (line #6). Finally, lines #14 to #28 are used to print the values at the front-end via simple if-else check statements in PHP. If the value of variable $aa_radio_val equals the label aa_hdr then print 'You Selected Header'. If the value of variable $aa_radio_val equals the label aa_bdy then print 'You Selected Body'. 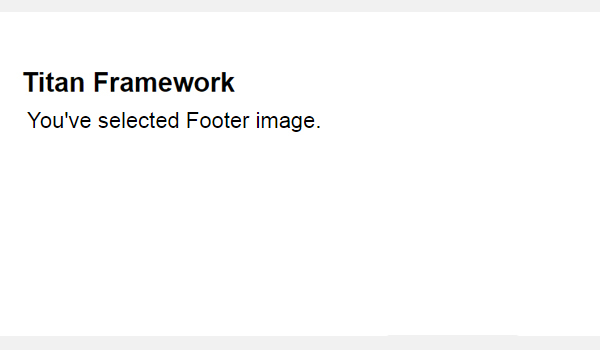 If the value of labels is not aa_hdr or aa_bdy then print 'You Selected Footer'. 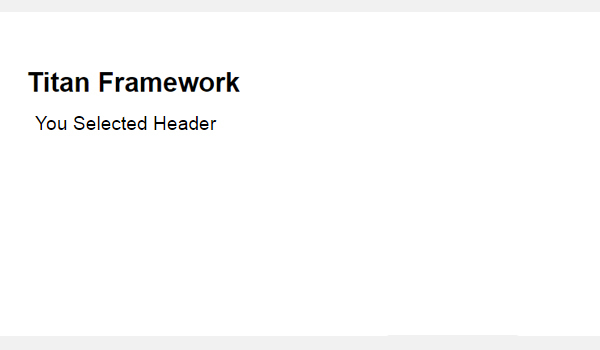 Suppose I selected Header as a demo value. Let's create this option type inside an admin tab. Now I'll add this option in an admin tab $aa_tab1 via the createOption() function. Its ID is aa_radio_in_tab1_panel2. The above screenshot shows this option in Tab 1 of Neat Options 2. Let's write the code for getting the saved values. First call a unique instance via the getInstance() function in line #3. Then use the getOption() function and register the ID aa_radio_in_tab1_panel2. Save this value inside a new variable $aa_radio_in_tab1_panel2_val in line #6. Next print the values at the front-end via an if-else check, i.e. lines #14 to #28. Now I'll write the code for a metabox. This time I added a radio type option in a metabox $aa_metbox with ID aa_mb_radio. 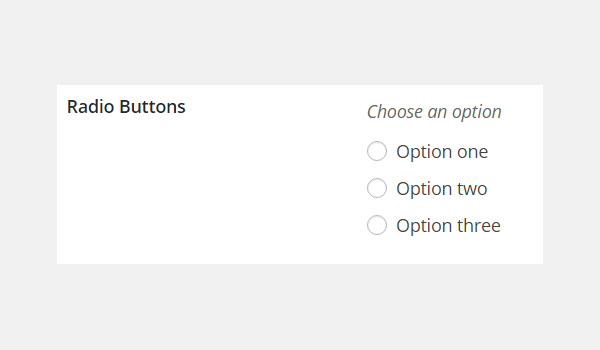 You can find this option named Choose Radio Buttons in a metabox. This screenshot is of a page editing screen. You will find similar option displayed in your post editing screens as well. Now I'll show how you can get a saved value in a metabox. The entire code is the same, except in line #6 where I've used the get_the_ID() function, which helps to fetch the saved value from any specific page or post ID. In the end, I'll add this option in a theme customizer section $aa_section1 whose unique ID is aa_sec_radio. You can find a list of radio options inside the Section 1 tab. Once again, getting the saved options values is done in the same manner. Only the ID and variable names are different. Here's a screenshot of the live changes which take place when I change the option settings. 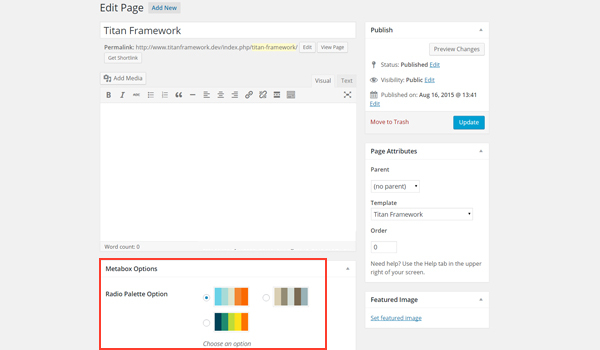 Now I'll show you how to display color palettes in the form of radio options inside a custom WordPress admin panel, a metabox, or a section of your theme customizer. Let's discuss the settings of this option. name: This parameter shows the display name. id: It defines a unique name which gets the saved values. desc: A brief description which appears with the option name. options: This defines a two-dimensional array which has sets of hex color values. 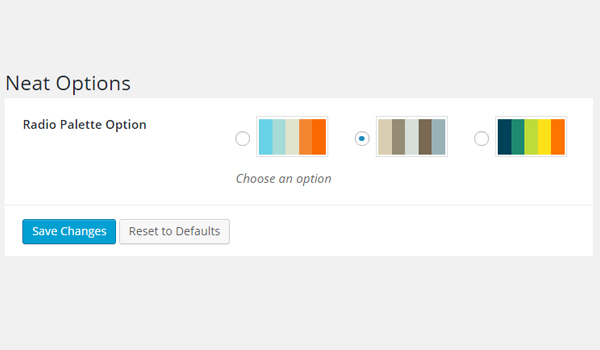 default: (Optional) It defines the options index of the default palette/color array. livepreview: (Optional) This parameter displays the live preview of changes when a radio-palette type option is added inside a theme customizer section. All the parameters are of type string, except the options which is array by type. Get the saved values via the getOption() function. The explanation of creating these containers is beyond the scope of this article. However, you can find their detail in previous articles of this series. Let's create this option type inside an admin panel. 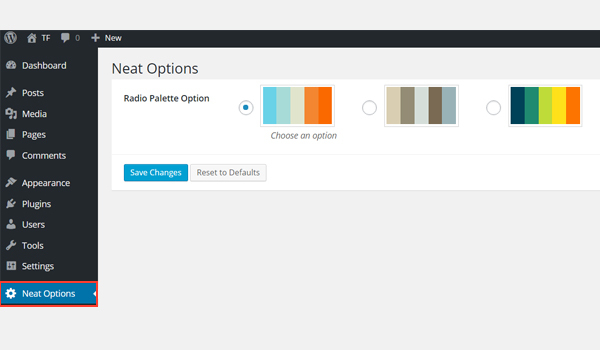 In line #8, I'm adding a radio-palette type option in an admin panel $aa_panel via the createOption() function. This function takes up an array of parameters which I've defined above. I defined the unique ID as aa_rad_palette in line #11. The most important parameter is defined in line #15 which is the options parameter. It's a two-dimensional array, which takes up multiple hex color values. Each array set adds a color palette. So between line #16 and #38 there are three such arrays; hence three options of color palette. In the above screenshot, there are three color palettes which appear against the name Radio Palette Option inside admin panel Neat Options. Now I'll write the code for getting the saved options values. The return value mechanism of this option works in such a way that it returns all the colors' hex values of the selected palette. So, to get these values, call an instance via the getInstance() function in line #3. Make sure that you register a unique parameter with this function. I'll recommend keeping your theme name. That's why I used neat here. In line #6, use the getOption() function, which retrieves the saved values by registering the option ID, i.e. aa_rad_palette. I saved its result to a new variable, $aa_rad_palette_val. I'm using the var_dump() function to see what gets saved in $aa_rad_palette_val. All the array contents of the second color palette get printed as shown above. Now you can easily use these values by accessing any element of this array, e.g. $aa_rad_palette_val will provide you with #D9CEB2 hex color. Now I'll add this option inside an admin tab. This time I'm adding a radio palette inside an admin tab $aa_tab1 with ID aa_rad_palette_in_tab1_panel2. Once again, I'm defining three arrays of color values, i.e. 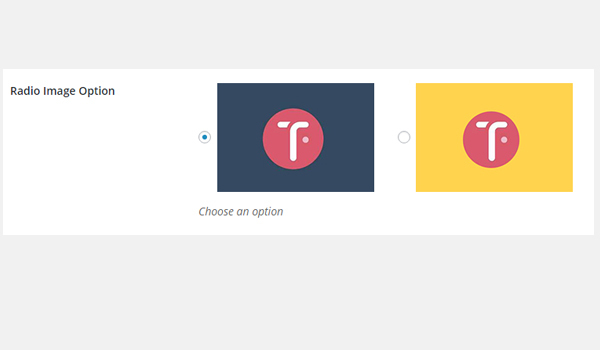 three color palette options. 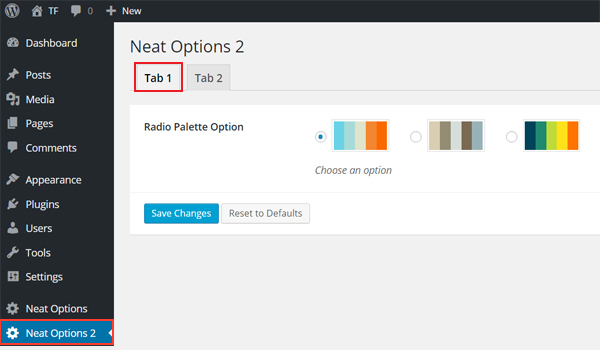 Here is the screenshot, where you can find a radio-palette type option in Tab 1 of admin panel Neat Option 2. Let's get the saved options values. Get a unique instance in line #3. Retrieve the saved value via the getOption() function in line #6. Print the array contents via the var_dump() function in line #16. This time I choose the first palette, and here are its contents. Let's create a radio-palette type option in a metabox. 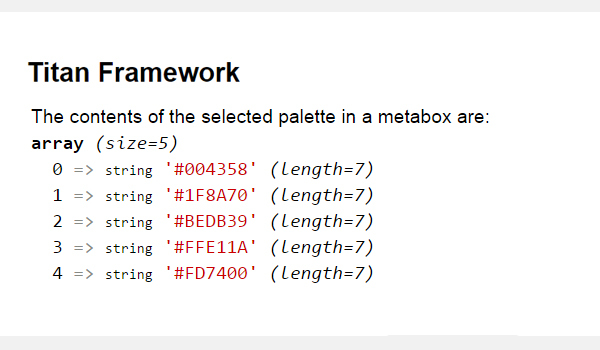 A radio-palette type option exists in a metabox $aa_metbox with a unique ID aa_mb_rad_palette. The createOption() function in line #8 takes up the same list of parameters which I've mentioned in previous examples. The above screenshot shows a page editing screen, and right at the end, a Radio Palette Option is displayed in a metabox. In line #6, there is an additional get_the_ID() function which provides the ID for a specific page/post or a post_type. The rest of the code is same. In the end, I'll add this option in a customizer section. This code adds a radio-palette type option in a theme customizer section$aa_section in pretty much the same way. 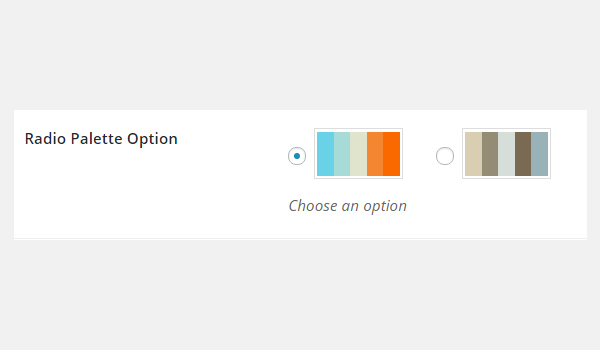 There is a My Section theme customizer section in which there are three options of color palettes named Radio Palette Option. Let's write the code to get the options values. 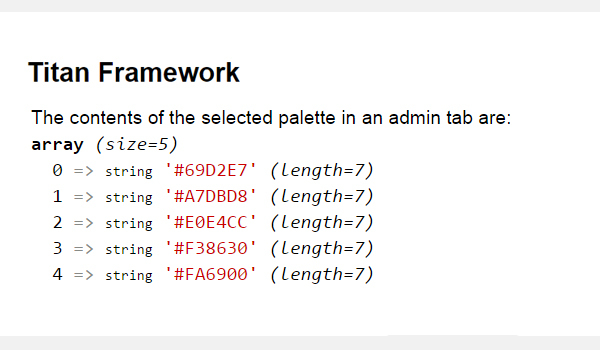 The code for getting the values from a theme customizer section is almost the same. Only the ID and variable names are different. So, you may refer to the details written above. Here is a screenshot of the live changes which take place. 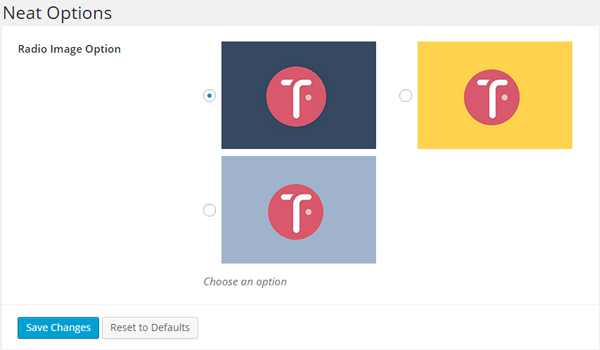 Finally, we're going to explore yet another option type in Titan Framework, theradio-image option, which displays a set of radio buttons with image labels. 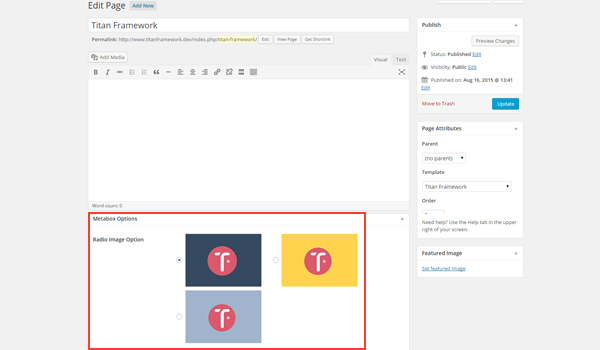 Today, I am going to write about how you can use the radio-image type option inside a custom admin panel, a metabox, or the theme customizer. name: It displays the name of the option type. id: It assigns a unique name which gets the values. desc: This parameter adds a brief description to the option type. options: (Optional) This defines a two-dimensional array which contains value and image URL pairs. default: (Optional) It defines the default value of the option. 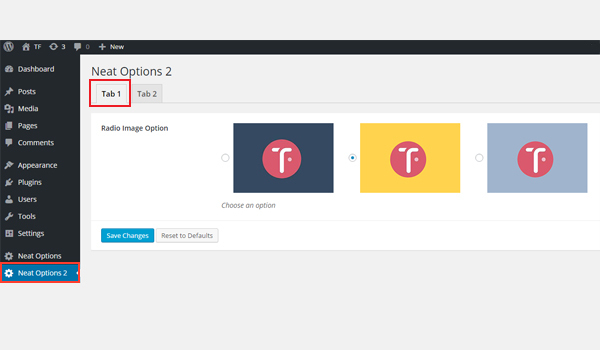 livepreview: (Optional) This parameter displays a live preview of changes when a radio-image type option is added inside a theme customizer section. The options parameter is array by type, while the rest are string. Get a unique instance through the getInstance() function. Add an option through the createOption() function. 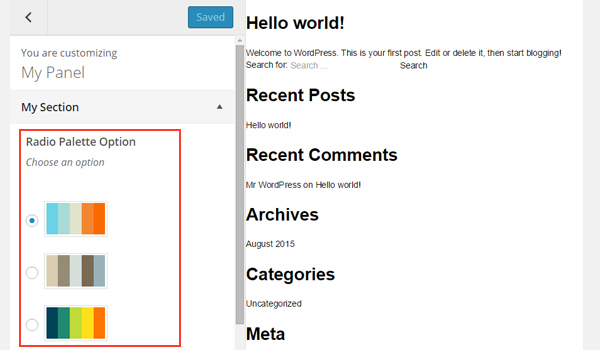 Get the saved values through the getOption() function. If you don't know how to create these containers, head back to previous articles in this series. First of all I'll create this option type inside an admin panel. In line #8, I'm adding a radio-image type option with the createOption() function inside an admin panel $aa_panel. This function takes up an array of parameters, i.e. name, id, desc, type, options and default. The ID (line #10) is aa_rad_image, which should always be unique. The options parameter at line #14 takes an associative array which defines image URLs and their labels. Each of these key-value pairs creates a radio-image option. So, I added three radio image options with labels: aa_hdr_img aa_bdy_img and aa_ftr_img. 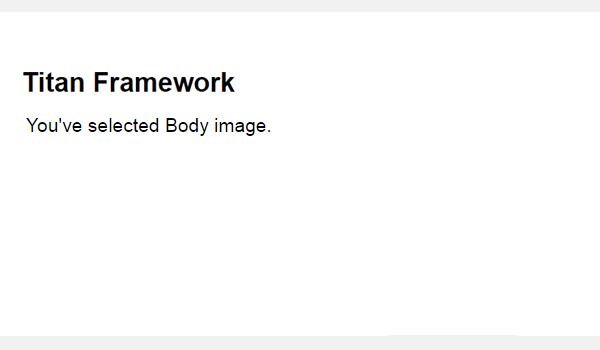 The get_template_directory_uri() function is used to fetch the path of the images for each label. In the above screenshot, you can view three radio-image options inside an admin panel Neat Options. Let's get the saved values. The process of retrieving the saved values starts from getting an instance in line #3 via thegetInstance() function. Then I used the getOption() function in line #6 with a parameter, i.e. an ID aa_rad_image, and saved its value to a new variable$aa_rad_image_val. Up to this point, the label of the selected radio image gets stored in this variable. This means that the user has selected an image from the dashboard and saved the setting. Now there are several ways in which you can display the saved setting values. Suppose I select the first image. The saved setting was for the label aa_hdr_img, so the corresponding statement was printed. Now I'll create this option inside an admin tab. This time I'm adding a radio-image type option in an admin tab $aa_tab1 whose ID isaa_rad_image_in_tab1_panel2. Once again, there are three image options. 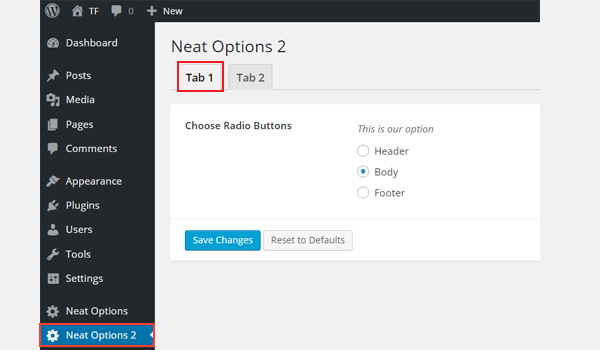 You can find this option inside Tab 1 of the Neat Options 2 panel. Get a unique instance in line #3 via the getInstance() function. Retrieve the saved options values in line #6 via the getOption() function. Print the saved user settings via if-else check statements in lines #15 to #27. Now I'll be adding the same radio images in a metabox. A radio-image type option exists inside a metabox $aa_metbox with unique IDaa_mb_rad_image. 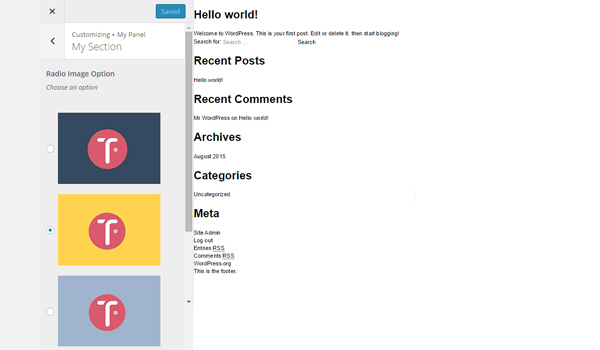 The image above shows a page editing screen, and right at the end there is a metabox within which this option exists. Let's retrieve the saved values. The only difference in the above code is found in line #6 where I've defined a new parameter inside the getOption() function. This is the get_the_ID() function which retrieves the value of a specific page or post ID. This time, I selected the third image and preview what appears at the front-end. The desired result is printed as shown in the above image. Finally, let's add this option in a customizer section. A radio-image option whose ID is aa_sec_rad_image is created inside a theme customizer section $aa_section1. There is a My Section customizer section, within which exists a Radio Image Option field. This entire code is the same—only the ID and variable names are different. 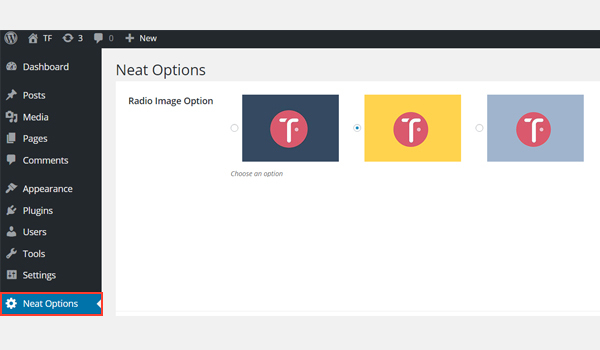 The radio-image type option can be used to help a user choose different layouts of your theme. 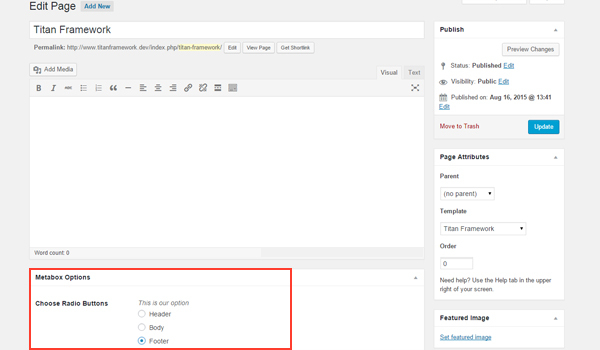 For example, most commercial themes allow the end user to choose between a left sidebar, right sidebar or no sidebar with a full-width page. This can be done with a radio-image type option in a metabox. You can also create several layouts for the output of a plugin, or provide the user with different background patterns to choose from. So this is how you can add a set of radio buttons in different containers. 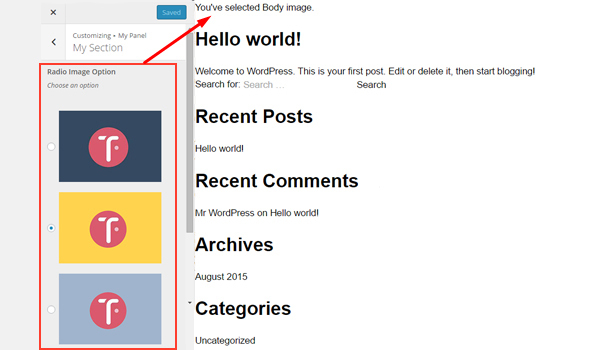 These buttons can be used to achieve an extended level of functionality in various places in your themes. 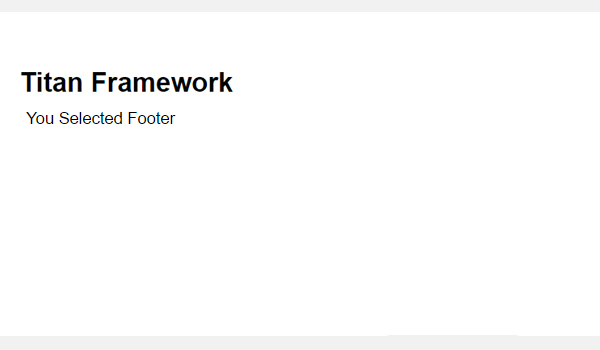 Additionally, this was quite a handy way of introducing some easy styling properties within your WordPress themes. 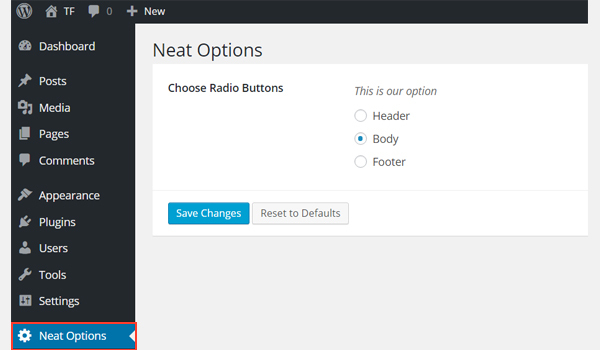 You can add radio palettes to allow users to change the theme's skins. In the next article, we'll explore another option which is related to this radio type. In the next article, we will explore some more options which are related to this radio type. Let me know if you have any questions via comments, or reach out on Twitter.